The husband is a total sucker for biscuits. Buttery, flaky, melt-in-your-mouth biscuits. 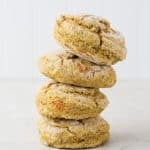 And don’t get me wrong, I love them too, but what I don’t love so much is the fact that traditional biscuits can run you over 200 calories and 10g fat, and have 0g fiber — so they don’t keep you full for very long. But then I found this recipe from the SkinnyMom cookbook (by Brooke Griffin) and I was totally inspired. 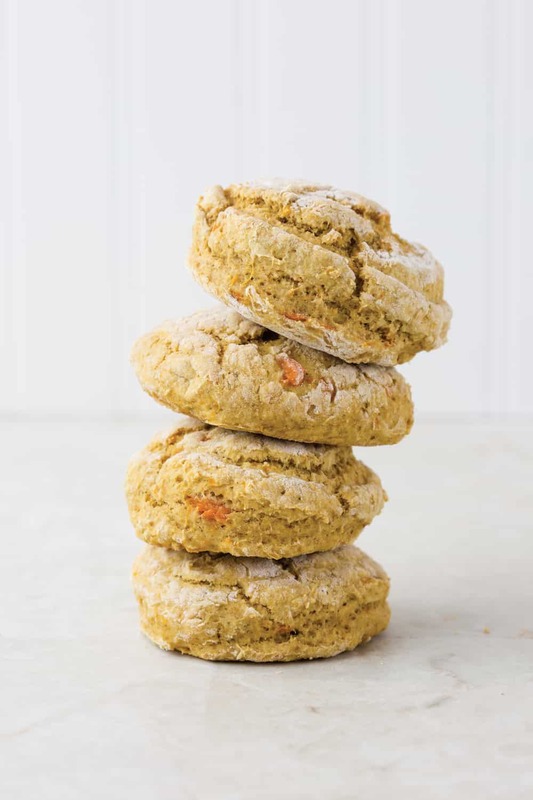 These sweet potato biscuits have tons of secret ingredients that lighten them up without losing any of those decadent soft layers you’d come to expect in regular biscuits. One biscuit has only ~140 calories, almost 0g fat, 3.6g Fiber and 4g Protein – so it actually works to keep you satisfied in between meals, or as a side along with your favorite dish! These biscuits use secret ingredients to keep them light and layered with the traditional flavor, but not all the fat. Wash the sweet potato and then poke the potato several times with a fork. Place it in a microwave safe bowl and add 2 tsp of water to the bowl. Cover with plastic wrap and cut a slit in the top. Microwave for 3 to 5 minutes, until soft and the skin is loose. Let cool. In a large bowl, whisk together the flour, brown sugar, baking powder, baking soda, salt, and cinnamon. In a separate bowl, stir together the syrup, applesauce, and buttermilk. Once the sweet potato has cooled, peel and mash well with a fork. Transfer the mashed sweet potato to the wet ingredients and stir to combine. Add the sweet potato mixture to the flour mixture and stir just until the dough comes together, being careful not to overmix. Lightly flour a clean surface and using clean hands transfer the sweet potato dough to the surface. It is very important to keep the surface covered lightly in flour, as the dough will be sticky. Gently roll the dough out to a 10-inch-diameter about ½ inch thick and use a 2 ½-inch biscuit cutter or the rim of a juice glass to cut out biscuits. Gather the scraps and re-roll to cut out more biscuits. You should get 10 biscuits. Transfer the biscuits to the prepared baking sheet. Bake until slightly browned on the edges, 24 to 28 minutes. Serve warm. Yum, Yum, Yum! This are yummy! I Wish to try this someday soon. Thanks Megha! I’m sure you will love it! Simple and very cool recipe 🙂 I like cookies like this! Thanks Katrina! I’m sure you will love these biscuits!